Anyone who grew up in middle Tennessee or southern Kentucky is familiar with Beech Bend Park. In my childhood it was the nearest amusement park and also had a raceway. Beech Bend is where I learned that amusement park rides don’t agree with me. This would have been in the late ’60s, I guess. I don’t remember the exact year, but I know I was not yet 12 years old. Daddy’s boss at Clarksville Base, Earl, was a college-educated engineer from somewhere in the midwest. He thought a lot of Daddy, and occassionally our family would socialize with his family. His wife was a little uptown for Mother’s tastes, but she knew better than to offend the boss’s wife. Their daughter Ruth Ann was a year younger than me. I thought she was a whiner and disliked her pretty much, but I’d been brought up to be polite, so we would play together every now and then. We all went to First Baptist Church as well. Earl invited us to go with his family to Beech Bend Park on a Saturday. We dressed up in our best clothes that weren’t quite for church, and Daddy wore his new grey Stetson hat, sor of a pork-pie hat as I recall. The boss and family picked us up in their brand-new Cadillace, and we set off for the park. I made it fine as long as I stuck to the carousel, the bumper cars, and the little-kiddie train which wove around a track. We ate hot dogs and cotton candy, and it was a fun day. 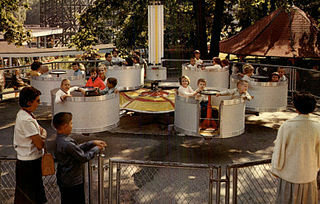 Then Ruth Ann cajoled me into getting into one of those spinning cup-and-saucer rides with her. I knew immediately this was a mistake. Everything whirled around, my stomach and my head went different directions, and I felt really dizzy. When the ride finally stopped I managed to walk over to my parents and try to look normal. “Are you all right?” Daddy asked me, in Ruth Ann’s hearing. “Fine,” I said with clenched teeth over the rising nausea. I was determined to hold on. We got into the Cadillac and set out for home. I felt worse and worse, really carsick. I was sitting in the back between Daddy and Mother. “Daddy, I’m going to be sick,” I whispered to him. “Baby doll, you can’t be sick in this new car,” he said. “I’m going to throw up, NOW,” I said. “Well, get sick in this, then,” Daddy said, and handed me his new Stetson hat. I threw up in it. His boss immediately knew something was wrong–it was hard to miss. So he pulled over, and I was sick some more by the side of the road. And Daddy threw away his new hat. Ever since then I’ve avoided amusement park rides. Disney World holds no appeal for me!